The Greater Kudu Antelope is considered to be the most handsome of the tragelaphine antelopes, which includes the bongo, eland, nyuala, bushbuck and sitatunga. 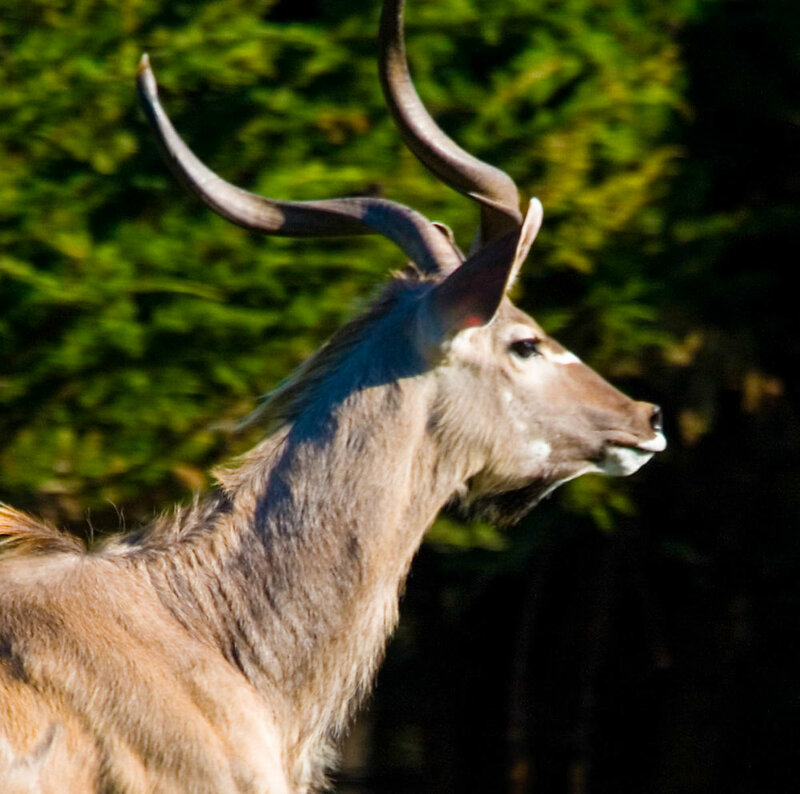 Kudu have stripes and spots on the body and have a chevron of white hair on the forehead between the eyes. 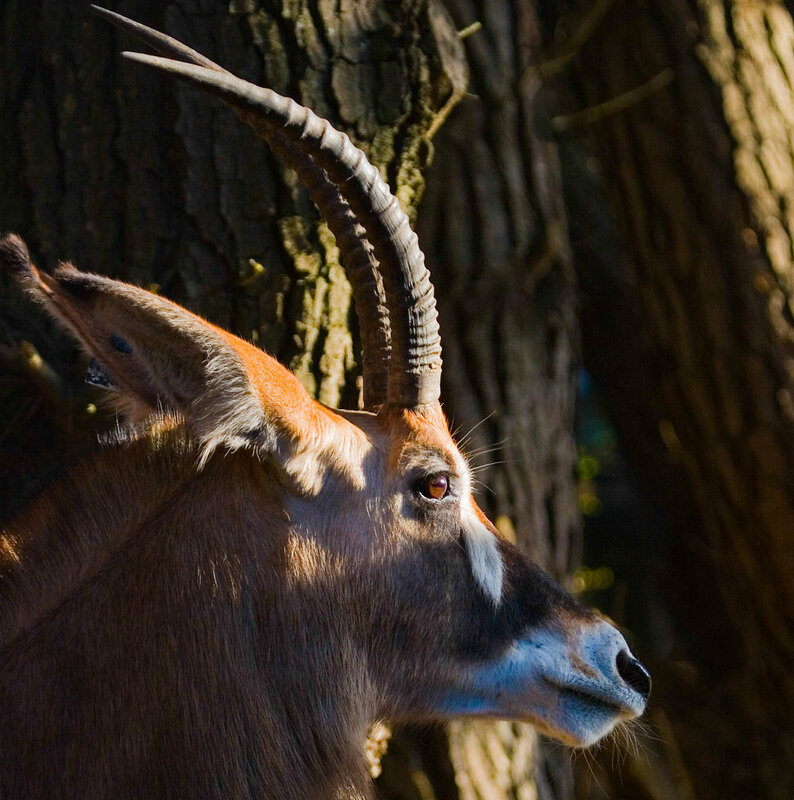 The Kudu ears are a distinct feature in both sexes, as they are particularly large and broad for the size of their head and fringed with white hair. Adult males have a short beard of dark hair and a fringe of long hair down the mid-throat. 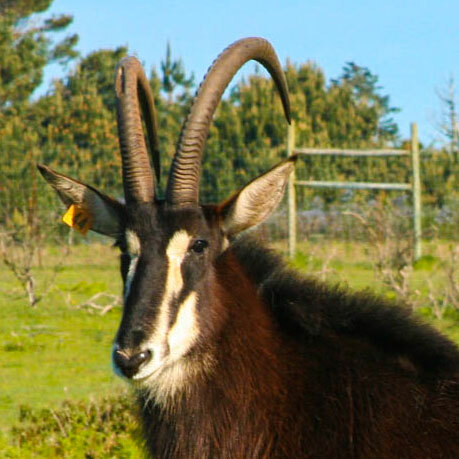 Males have long spiral horns which can grown as long as 72 inches, making 2.5 – 3 graceful twists. These beautifully shaped horns have long been prized in Africa for use as musical instruments, honey containers and symbolic ritual objects. In many cultures, the horns are thought to be the dwelling places of powerful spirits and in others are a symbol for male potency. The horns are seldom used in defense against predators. They also do not impede travel in wooded areas — the kudu simply tilts the chin up and lays the horns against the back, moving easily through dense bush. Female kudu are noticeably smaller than the males and do not have horns. The call of the Kudu, the loudest of any antelope, is a penetrating hoarse bark. When alarmed, kudu run away, lifting their tails over their rumps and fanning out the white undersurface as a warning signal to others. Despite their incredible horns, the kudu is a gentle animal, preferring flight to fight. When hunted, they will sometimes stop in their tracks and look to see if the predator is still chasing them — many times this is a fatal mistake. Kudu are graceful leapers and are capable of leaping 9 feet with little effort. They have a keen sense of hearing to help them detect predators. When hunted, if close to water, they will take refuge in it as they are powerful swimmers. The hierarchy among kudu males is usually determined by age and size. Males of about the same size and age will engage in sparring contests. They approach each other slowly, lock horns and push back and forth until one gives up. Usually, no serious injuries result. Occasionally, 2 combatants will lock horns in such a way that they could not disengage, dying with their horns together. Sometimes males form small bachelor groups, but more commonly they are solitary and widely dispersed. Females and their offspring form small groups of 6 to 10. There is no obvious hierarchical rank in these groups. Greater Kudu are seasonal breeders in Southern Africa, calving during the rainy season, February to June, and mating near or after the ends of rains. Females typically breed at about three years of age. There is a nine month gestation period and the calves are born when the grass is high and vegetation lush. The mother will leave the herd to give birth. She will leave the newborn lying out for 4 to 5 weeks, one of the longest periods of all antelope. The calf then begins accompany it’s mother for short periods of time and by 3 to 4 months is with her constantly. Calves grow rapidly and at 6 months are fairly independent of their mothers.